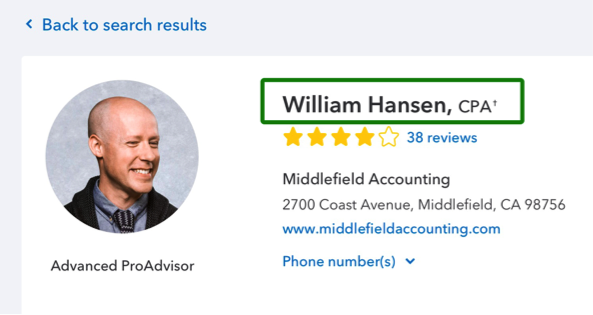 Find-a-ProAdvisor is the world’s largest network of small businesses who are looking for accounting experts like you; the site received 1 million visitors last year! We are continually improving Find-a-ProAdvisor to help you create an effective online profile and grow your practice. From there, it’s easy to add your information and create a profile. When you’re ready to publish, just click “include in search results” and your profile will appear for future clients to find. It’s easy to get started, but really getting the phone to ring takes a bit more effort. 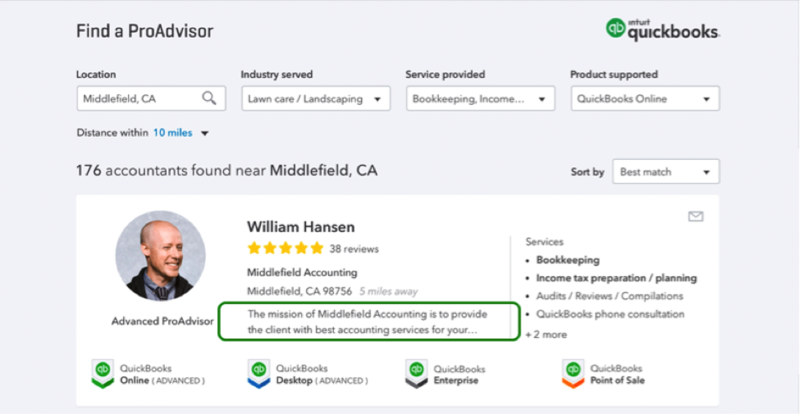 In addition to finding a nearby QuickBooks® expert, visitors are looking for a few key indicators of a well-matched ProAdvisor. Based on extensive research and testing, we have identified the top five actions you can take to increase your profile views and get more leads from the clients you want. #1: Include a photo. Profiles with a photo are significantly more likely to be viewed than those without one, so give your prospects a good first impression with a professional looking headshot. It could help you be the first person they call! Don’t use your company logo, or show buildings or scenery. Show a picture of you, and be sure to choose a high-resolution image (600 x 600 pixels or higher). #2: Get (more) reviews – and quality matters. Our research has shown that most prospective clients won’t even look at a profile without reviews. Asking for reviews from your clients can be hard, but remember that most would love to repay you for the value you’ve provided. Check out our article, 7 Ways to Get Your Clients to Write Reviews, for best practices and an email template you can use to request reviews. 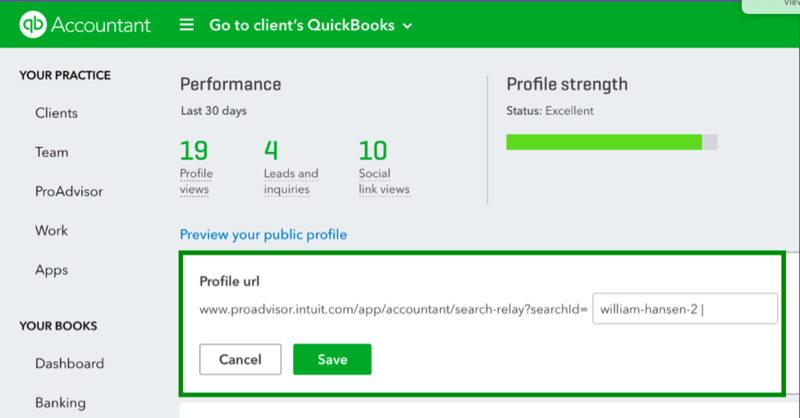 Pro Tip: You can now find and edit your public profile URL right inside QuickBooks Online Accountant. Pro Tip: You can also reply to reviews to demonstrate your excellent customer service. #3: Write a thoughtful “about me” section with a strong intro. The first line is the most important because it is the only part that shows up on the search results page. Use this space to share what you most want potential clients to know about you to encourage the right ones to learn more by continuing to your profile. When writing your “about me,” remember to use simple language that prospects can understand, and focus on the value you can provide to them. #4: Showcase your specialties. When it comes to selecting your industries served, less is more. Studies have shown that small businesses prefer to work with accounting professionals who specialize in their industry, as opposed to generalists. Narrowing down your selections to just those you’re very knowledgeable about or want to work with helps prospective clients to realize that you are a good match for a business like theirs. Pro Tip: Make sure to select the appropriate credentials, especially if you are a CPA or EA. To make it easier for clients looking for tax pros, CPA and EA titles now display after your name. #5: Complete all profile fields. Make sure your profile is up-to-date and complete, including links to your website and professional social sites such as LinkedIn and Facebook, if available. Finding the right accounting pro is one of the most important decisions a business owner will make, and so they’re eager to learn more about you. Pro Tip: You can now show if you offer a free consultation by simply checking a box. The free consultation flag on your profile provides one more reason for prospective clients to contact you. Now, go polish your profile – a little effort goes a long way. We’ll keep working hard to connect you with the small businesses and individuals who rely on your expertise – helping your firm and all our customers succeed. Not yet listed on Find-a-ProAdvisor? Learn more about our award-winning education and certification program, and get certified to publish your profile and take advantage of everything the free ProAdvisor Program has to offer. 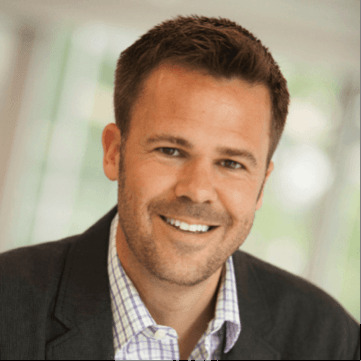 Rich Preece leads the Accountant Segment for Intuit, both in the United States and across international markets. he is responsible for developing a suite of QuickBooks SaaS products, related training and education programs for accountants and bookkeepers.